“Personally Identifiable Information” refers to any information that identifies or can be used to identify, contact, or locate the person to whom such information pertains, including, but not limited to, name, address, phone number, fax number, email address, financial profiles, and credit card information. This list does not represent the specific information collected on this Site, but simply lists examples of what qualifies as Personally Identifiable. Personally Identifiable Information does not include information that is collected anonymously (that is, without identification of the individual user) or demographic information not connected to an identified individual. We collect no Personally Identifiable Information from Visitors who do not interact with any forms (comments, contact form, registration, orders). All forms contain fields that clearly identify the information collected. We collect the following information from our Customers: name of company, shipping address, phone number, and the name and email address of the contact person. What Non-Personally Identifiable Information is collected? We may collect users’ IP addresses for security purposes and to analyze geographical reach. In addition to our direct collection of information, our third party payment service provider (PayPal) may collect the same or additional Personally Identifiable Information from Customers. We do not control how our third party service payment provider uses such information, but we work only with reputable providers. We use Personally Identifiable Information mainly to fulfill order requests on the Site. We may also use it to customize the Site. We may email Customers about their orders and about new offerings. We may also use Personally Identifiable Information to contact Visitors and Customers in response to specific inquiries, or to provide requested information. Personally Identifiable Information collected through miko-greetings.com is stored within the European Union in our online database, which is protected from unauthorized third party access by commercially reasonable security measures. Customer information is also stored in our offline records of sales and Customer address book. Visitors who do not wish any Personally Identifiable Information to be gathered can avoid using any of our online forms (comments, contact, registration, orders). In the rare instance we might contact Commenters directly rather than by on-site reply, they may opt out of receiving unsolicited information from us or being contacted by us by responding to any emails received. Customers can contact us by email if they wish to request that all Personally Identifiable record-keeping be kept offline. We will still need to store ordering information online if ordering is done online, but the Personally Identifiable Information involved can be obscured even in the database, if need be, by placeholder data that refers us to the offline records for company name and shipping information. Administrators of the Site gain access to Customers’ Personally Identifiable Information using a secure login username and password. Security software, updated on a regular basis, provides extra protection against any malicious attempts to gain access. While we take these commercially reasonable measures to maintain a secure site, no online security system can be guaranteed 100%. Electronic communications and databases are subject to errors, tampering and break-ins, and we cannot guarantee or warrant that such events will not take place. We will not be liable to Visitors or Customers for any such occurrences. However, the Personally Identifiable Information we collect does not include any financial account information, as that information is given by the Customer directly to our payment service provider (PayPal) without Miko Greetings having access to it. How can Customers correct any inaccuracies in Personally Identifiable Information? Customers who have a registered user account may update Personally Identifiable Information through their user account profile. Customers who have not registered for a user account may update previously submitted Personally Identifiable Information or correct any inaccuracies by contacting us by email or through the contact form. Our mechanism for Visitors and Customers to delete/deactivate Personally Identifiable Information from the Site’s database is by contacting us by email or through the contact form. However, because of backups and records of deletions, it may be impossible to delete a Visitor’s entry without retaining some residual information for a certain time. A Visitor or Customer who requests to have Personally Identifiable Information deactivated will have this information functionally deleted, and we will not sell, transfer, or use Personally Identifiable Information relating to that individual or company in any way moving forward. “Cookies” are pieces of code that are generated at the time of a user’s visit to the Site and stored on the user’s computer so the Site can verify the user is still the same user. Cookies expire according to the schedule or date encoded in them or when a specific event occurs. For instance, a Session Cookie expires when the user logs out or closes the browser. We use Session Cookies to maintain a Customer’s logged-in status and give them access to content they could not access without being logged-in. We use Commenter Cookies to allow commenters the convenience of having their details remembered in case they wish to post a new comment within a year of the first. We may at times use Google Analytics cookies to analyze the way Visitors use our Site. However, such cookies do not store Personally Identifiable Information. How does Miko Greetings use login information? Miko Greetings may use login information, including, but not limited to, IP addresses, ISPs, and browser types, to enforce security measures, analyze trends, administer the Site, track a user’s movement and use, and gather broad demographic information. 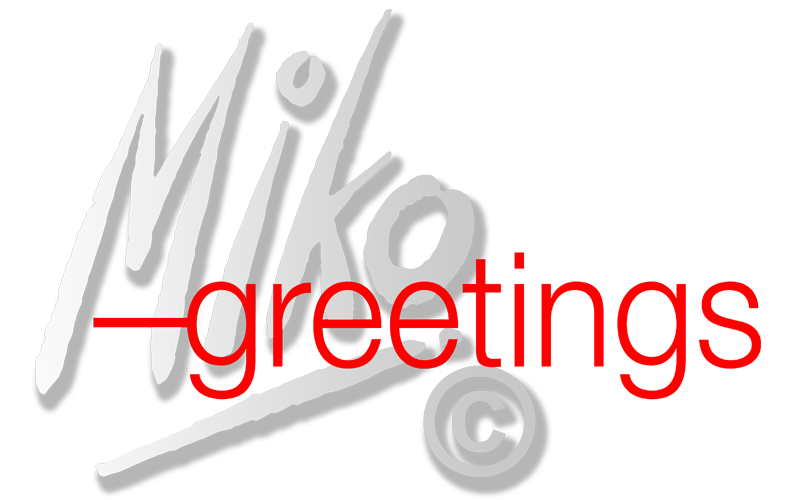 Miko-greetings.com contains links to other web sites. Please note that when you click on one of these links, you are moving to another web site. Their privacy policies may differ from ours, and Miko Greetings is not responsible for the policies of any linked sites.